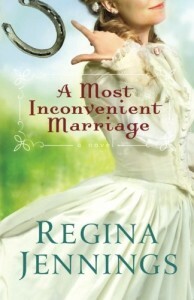 A Most Inconvenient Marriage by Regina Jennings is a Christian historical romance. It is a highly amusing read that had me smiling over some of the situations portrayed. It was a comedy of errors with various plots and match making. Abigail nurses the injured prisoners during the American Civil War. On his deathbed Jeremiah Calhoun marries her, leaving her his ranch and horses, and extracting a promise that she will nurse his sister Rachel, and take care of his mother. Following the war, Abigail is welcomed with open arms by Jeremiah’s Ma. Abigail is making a success of the farm when her life is interrupted by the arrival of Jeremiah himself! This is most inconvenient, especially as Abigail has never seen this Jeremiah Calhoun before. Who did Abigail marry? Who is the real Jeremiah? The novel deals with a number of themes, including that of forgiveness. Rachel harbours unforgiveness in her soul, it oozes from every pore, making her bad tempered and bitter. Can she ever be persuaded to let go of her grudge and anger? Regina Jennings shows that the state of one’s soul can be revealed in ones personality. Abigail has a sunny disposition, is concerned with justice, and goes out of her way to help and to work hard. She has her eyes and heart on God, always trying to do what is right. A Most Inconvenient Marriage has its very light-hearted moments. The neighbours children, Josiah and Betsy, love playing pranks on Abigail. She in her turn, turns the tables on them – the results are highly amusing. Regina Jennings portrays very real and likeable characters. There are some wonderful moments of sparring between Abigail and Jeremiah. Both can give as good as they get, and the reader is royally entertained. The characters are in a close knit community. They help each other when needed, and band together to fight a group of bushwhackers. God’s plans are revealed within the story, showing that His plans are not always our plans. His plans are far better for us, than we could ever imagine. The theme of healing runs throughout the novel. There is physical healing needed for wounds from the war and illness, as well as healing needed for the soul. There are several love matches and triangles within the novel. These make wonderful reading, and are reminiscent of some of Shakespeare’s comedies – A Midsummer Night’s Dream springs immediately to mind. I found myself laughing at some of the scenarios, particularly those involving the skunk. A Most Inconvenient Marriage was the first novel I had read by Regina Jennings, but I will be reading more. She is a highly amusing writer whose work is very much grounded in God, and I can certainly recommend picking up her book for a highly entertaining read.